Delhi, also known as Dilli is officially the National Capital Territory (NCT). It not just happens to be one of India's largest cities but is a perfect combination of antiquity and modernity. It is India's second most populous city after Mumbai. It is renowned for being home to many architectural masterpieces such as the Qutub Minar, the Red Fort, India Gate, the Akshardham shrine and many more. Travellers coming here can explore these architectural wonders and also learn more about the history of this place. 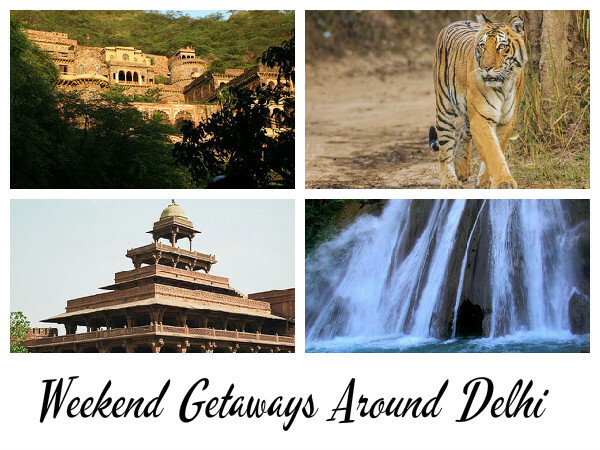 There are many weekend getaways around Delhi where travellers can head to and enjoy the tranquility of nature that is offered to them. Here is a guide to eight places near delhi where you can escape into the arms of nature. Click Here to avail Rs. 6,000 OFF on Flight and Hotel Bookings. Alwar, a hilly region located amidst the craggy rocks of the Aravalli Ranges, is a major tourist attraction. Mythological belief persists that this region was known as Matsya Desh where the Pandavas are believed to have spent their 13th year of exile. It is also known as Mewar and is famous for beautiful lakes, grand palaces, magnificent temples, glorious cenotaphs, and towering forts. Some of the places to visit in Alwar includes the Bala Quila, the City Palace, Moti Doongiri, Bhangarh Fort, Sagar lake and many more. It is located 156 km away from Delhi and takes nearly 2 hours 50 min to reach. Kurukshetra when translated literally means the field of righteousness. It is a land filled with history and mythology. It was here that the historic battle of Mahabharata took place between the Pandavas and the Kauravas, and also the place where Lord Krishna sermonised the Bhagwad Gita to Arjun. It is a sacred place for the Hindus and is visited by many pilgrims and tourists round the year. The region enjoys a rich and colourful history and with the passage of time the sacredness of this place has only grown. The region is said to have been visited by Lord Buddha and various other Sikh gurus, thus increasing its religious importance. The town has a large number of devotional centres that includes holy shrines, temples, Gurudwaras and kunds, some of which trace their roots to the Mahabharata period. It is at a distance of 171 km from Delhi and takes up to 3 hours to reach here. One of the former capitals of India, Agra in Uttar Pradesh is a hub of monuments that add to the pride of Indian heritage. Taj Mahal, Agra Fort, Chini ka Rauza are some of the known and widely popular monuments of Agra. Explore these plces or be marvelled by their splendour. These monuments hav stood the test of time and gives a peek into the history of of this place. It is situated at a distance of about 211 km from the capital and nearly takes 2 hour 50 min to reach. Built by the Mughal Emperor Akbar, Fatehpur Sikri is now a UNESCO World Heritage Site that encompasses the grandeur of the Mughal Kingdom. The unique feature about this place is that the entire region was well-planned. It has many famous monuments and is truly a major tourist destination. There are many places to visit here, and you will be mesmerised by the beauty of the buildings that stand here. It is a hub for historians who visit this place to learn more about Emperor Akbar and the Mughal era during his reign. It is 223 km away from Delhi and takes 3 hour 30 mins to reach. Dehradun, popularly known as the Doon Valley, is the capital of Uttarakhand state. The destination is perched at an elevation of 6400.8 mt above sea level and lies in the foothills of the Shivalik Ranges. The River Ganga flows to the east of Dehradun, while the River Yamuna flows to the west. Dehradun derives its name from the words ‘dehra' meaning ‘camp' and ‘dun' meaning ‘the low lands at the foot of the mountains'. The place attracts a large number of tourists every year. The pleasant weather and the natural surroundings have made the destination popular among tourists. Moreover, it is the gateway to some of the other beautiful destinations ofUttarakhandsuch as Mussoorie,Nainital,Haridwar,Auliand Rishikesh. Named after Jim Corbett, the legendary tiger hunter and enchanting writer who put Kumaon on the mind map of people with his book 'The Man-eaters of Kumaon', this is India's first national park and one of the best in Northern India to see nature at its closest. Today, tiger sightings here take a lot of luck with some 150 odd tigers here in the sanctuary. Whether you sight a tiger or not, it is guaranteed that no wildlife enthsiast will leave this place disappointed. Commonly seen wildlife include wild elephants, sambars, leopards, mugger crocodiles, gharials, sloth bears and many more. Jaipur, popularly known as the ‘Pink City', is a beautiful old city of India. The capital of Rajasthan, Jaipur, is situated in a semi desert territory. This picturesque city was built by Maharaja Sawai Jai Singh II, King of Amber, with the help of an architect from Bengal known as Vidyadhar Bhattacharya. It is also the first city of India which was planned according to the ‘Vaastu Shastra'. Jaipur, which is noted for its forts, palaces and havelis, attracts visitors in large numbers from all across the globe. People from far flung areas visit this place to witness the rich culture and tradition along with its historic heritage. TheAmber Fort, theNahargarh Fort, theHawa Mahal, theSheesh Mahal, theGanesh Pol, and theJal Mahalare some of the popular tourist attractions of Jaipur. Mussoorie, popularly known as the ‘Queen of Hills', is a well known hill station situated in the Dehradun District of Uttarakhand. It is located at an elevation of 1880 mt above sea level on the foothills of the Great Himalayas. The place is well-known for providing amazing views of the Shivalik Ranges and the Doon Valley. It is also known as the gateway to the religious centres ofYamunotriand Gangotri.